BLACKSBURG, Va. — Much like the weather conditions, Virginia Tech’s offense wasn’t pretty on Saturday vs. Duke. It was effective enough, however, and the No. 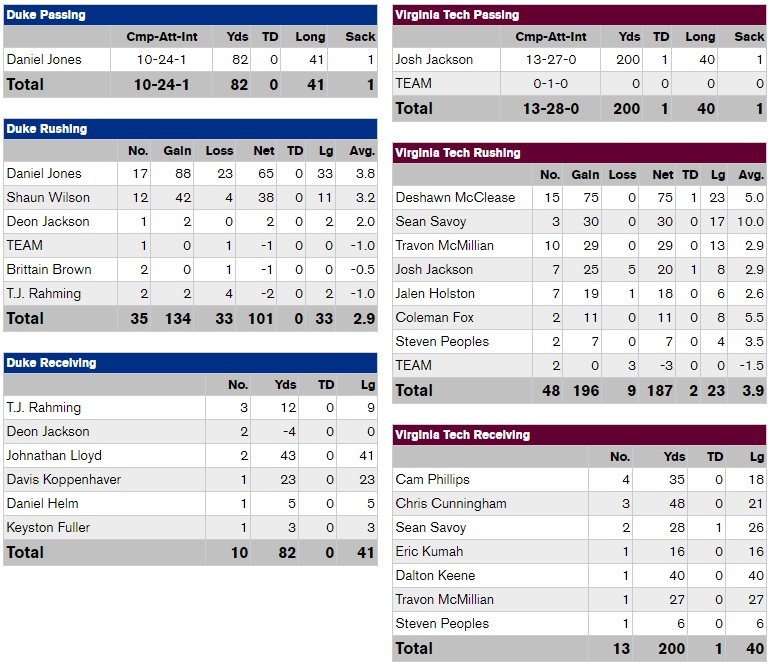 13 Hokies cruised to a 24-3 win over the Blue Devils. 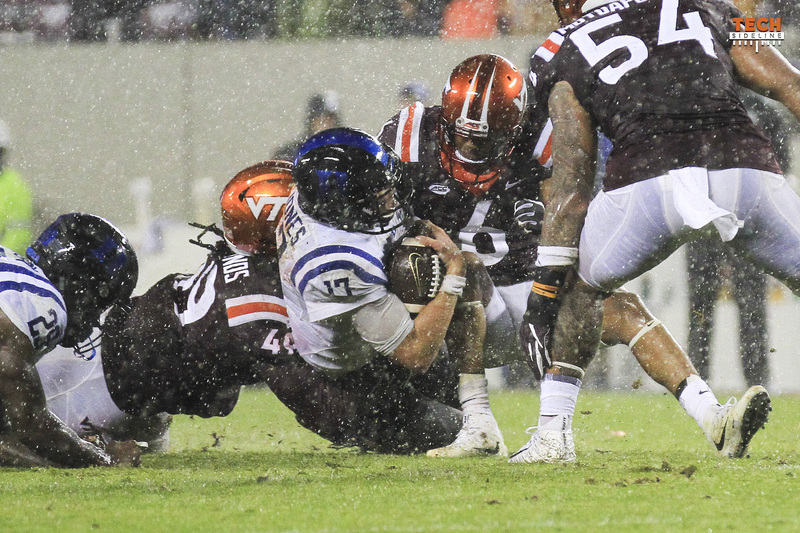 The Virginia Tech defense stifled Duke all night long, and may or may not have been aided by the poor weather. 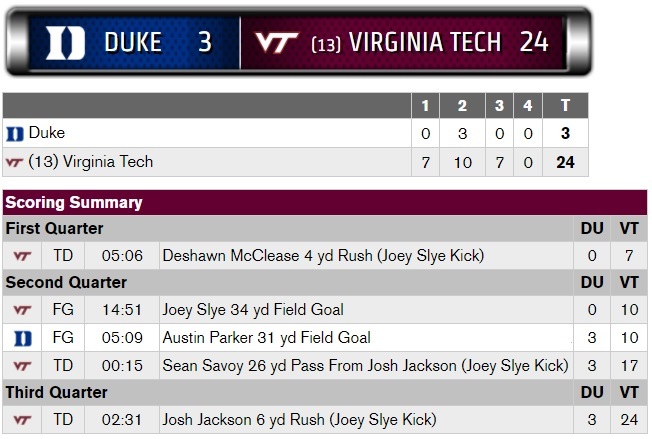 The Hokies’ defense bottled up the Duke offense, allowing just 183 total yards. Duke quarterback Daniel Jones went 10-24 for 82 yards and an interception, while the Blue Devils went just 4-15 on third down conversion attempts. Mook Reynolds had a standout performance for Tech, finishing with 2.5 tackles for loss and a forced fumble in the second quarter. In all, six players recorded at least one tackle for loss and the Hokies finished with nine as a team. The biggest thing hindering Duke’s offense was their inability to run the football. The Blue Devils averaged just 2.9 yards per carry, with Jones’ 65 yards leading the way. Tech’s special teams definitely made an impact. Punter Oscar Bradburn downed four punts inside the Duke 10-yard-line, while Greg Stroman averaged eight yards per punt return. Those two efforts helped the Hokies maintain good field position all game long, as Virginia Tech’s average starting field position was past their own 39-yard-line. In contrast, Duke’s average starting field position was just past their own 20-yard-line. 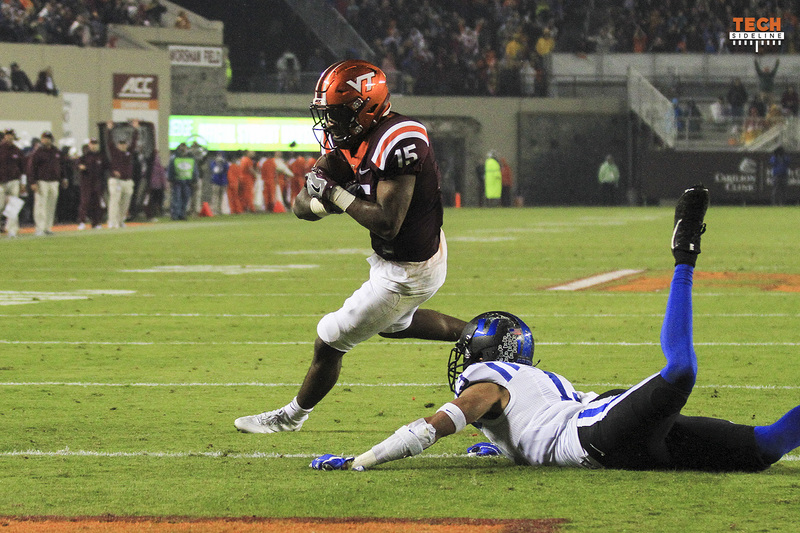 Bradburn and the punt team’s ability to pin the Blue Devils deep inside their territory aided the Virginia Tech defense more than the weather. The rain may not or may not have impacted Virginia Tech’s offense, but the Hokies were effective nonetheless. The Hokies avoided turning the ball over, and ran for 187 yards on 48 carries, averaging 3.9 yards per rush. Deshawn McClease, who led the way with 75 rushing yards and a score, credited the offensive line after the game. Josh Jackson had a less than stellar day. He finished the game 13-27 for 200 yards and a touchdown, but also added a rushing touchdown to the scoreboard. Even though it was an uneasy performance, Jackson and the Hokies took care of the ball and didn’t even have a bad snap in the driving rain. Virginia Tech got their licks in on offense before the rain kicked in. 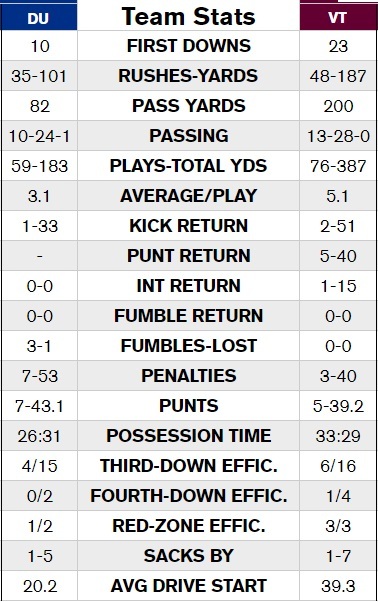 After failing on a fourth down conversion attempt on their first possession, the Hokies embarked on a nine-play, 71-yard drive that ended in a McClease score. Tech then took advantage of a fumble by Duke’s Jones to tack on a field goal at the beginning of the second quarter for a 10-0 advantage. Duke’s offense struggled for the entirety of the first half, but put together one good drive in the second quarter. Duke’s Jones converted two third downs, including a 41-yard pass to Johnathan Lloyd, and drove the Blue Devils down into field goal range. Austin Parker nailed a 31-yard field goal to cut Virginia Tech’s lead to just one possession. While the Hokies’ offense slogged around for most of the second quarter, Tech caught a break before halftime. A personal foul on Duke’s Shaun Wilson backed Duke up into their endzone on fourth down. After the punt, Jackson connected on a 26-yard pass to Sean Savoy to give Virginia Tech a 17-3 lead after two quarters. That sequence, which gave the Hokies a two-score lead heading into the halftime, flipped the momentum a bit. Duke was hanging around, but with the rain getting worse as the night dragged on, 14 points was almost insurmountable. Virginia Tech’s offense continued to slosh around in the rainstorm in the third quarter, but added on to the lead late in the period. The Hokies engineered an eight-play, 43-yard drive that ended in a Jackson touchdown run from six yards out. The Hokies took a 24-3 lead, effectively ending the game before the fourth quarter began. Virginia Tech’s win puts them in great position heading into their two-game road trip. The Hokies will travel to Florida next week for a date with No. 8 Miami, who’s undefeated. After that, they get always-feisty Georgia Tech in Atlanta. But for now, Virginia Tech is 7-1, and 3-1 in the ACC. Never seen so much water on the field. Did they turn the pumps on to help drain the water? Same question here – I can’t believe the pumps were functioning at full capacity if at all. I’ve seen it rain that hard but since the special suction system was put in, never seen standing rain on the field. Anyone know what was going on with the drainage system? I thought we had more than one sack. What actually constitutes an official sack? Was surprised no one mentioned the poor clock management by Cutcliffe before the Savoy TD. The clock started after the Unsportsmanlike penalty with 46(?) seconds left. They shout have run it down to 19 and then punt. Instead they punted with 20 seconds left on the play clock and 41 left in the Qurter. Tech scored with 15 seconds left. Tech completed a pass and then killed the clock before the TD. Don’t think they would have had time to do that if Duke had run clock down. Actually, because VT turned down the ten second run off the clock started at the snap. The ref made sure to correct himself. Yeah, personal foul cost yards and clock which made it really costly! I was rewatching that and saw that. Looks like the ref corrected himself to the crowd/timekeeper but on camera the broadcasters were talking over it. It’s at 1:25:45 on https://www.youtube.com/watch?v=EHsCIdVNKow if curious as I missed the play first time around. It was cold & wet in the stands but glad I stayed until the final kneel down. Great game for the team especially the defense. Need to bring that intensity to Miami. Glad to see Coleman Fox get a couple of carries with first team. Go Hokies. Great call on giving some love to Oscar….what a weapon. After watching Miami yesterday, I believe we should be able to take care of business next week. Good teams find a way to win, and that is what we did on Saturday. The next 4 games we will need to keep that thought in mind. 1-0 every week. I keep waiting for Mook to get a targeting call. His hit on Jones in the 2nd half after Jones was already down was very suspect. Watching TV replay, thought the same. I thought that as well on that very play. Anybody else feel like VT’s offensive line just can’t push anybody around: in good weather, bad weather, against inferior teams or superior teams? Week in, week out, it’s like ‘meh’. If we had a line who could truly impose its will at times, we would be a top 15 team. Yes, we have the ranking but I’m not convinced yet. My early gut reax to the Canes next week is — we’ll win. Just got a feeling. Go HOkies! Yea bc they CANT push anyone around. It’s not really an opinion it’s a fact if u watch the tape. Remember these aren’t CJF recruits but they have received his blocking coaching two years now. Not sure what the answer is. If you guys don’t appreciate Mook’s outstanding play why don’t you go to ladies volleyball, swimming etc. maybe they won’t offend you. IMO that’s pretty much every play with him. He seems to be the “chippy” type of hitter. Little something extra every play, but not in a good way. Surprised it hasn’t been flagged at all this year.